Note: This post was written by Craig White and LB Brier, who serve on our Supportive Schools team. What is it like to be an LGBTQ student in Western North Carolina today? 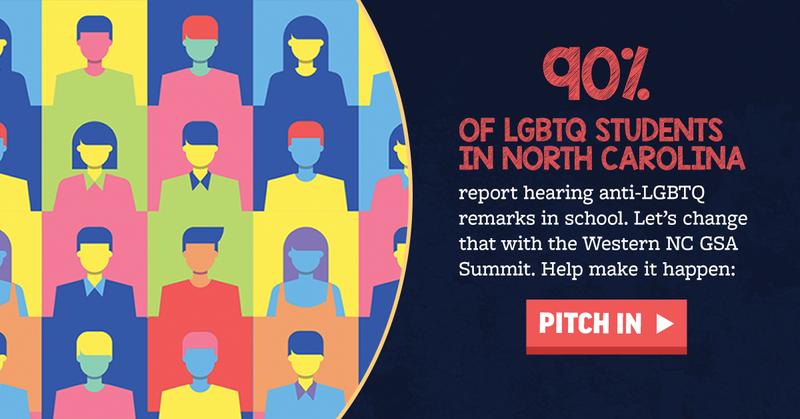 According to GLSEN’s National School Climate Survey, more than 90% of LGBTQ students in North Carolina report regularly hearing anti-LGBTQ remarks in school. More than 70% report some form of discrimination, harassment or assault. Students rely on GSAs and similar clubs for peer support, inclusive social activities, and opportunities for visibility. Yet less than half of North Carolina’s schools have a GSA. In rural areas like WNC, the problems are even more severe, and the support is harder to find. The Campaign for Southern Equality and Youth OUTright WNC are excited to collaborate on the Western NC GSA Summit, which will bring together more than 150 students and faculty from more than 20 schools and organizations in at least 8 rural, mountain counties. These young people are our inspiration – despite what they experience every day, they bring a fierce desire to be visible and to have their voices heard. Can you join us by fueling this vital work? Click here to make an impact. The Summit will provide opportunities for youth leadership, from facilitating discussions to planning and leading their own workshops. The Summit will develop connections between different schools, provide tools for strengthening existing GSAs, and offer skills and strategies for organizing new inclusive student clubs. Students will also have the opportunity – many of them for the first time – to be at a large gathering where every person’s gender and sexual identity is celebrated. Beyond the positive experience of the event itself, we hope that connecting these schools and groups will result in new GSAs being created in schools that don’t have them now. We’re also excited at the opportunity to share the inclusive LGBTQ support guidelines that some schools have adopted and spread those more broadly across the region. Become a sustaining donor to CSE and support the Supportive Schools Program all year long. Thank you for supporting LGBTQ youth in Western North Carolina! P.S. Is your business or organization interested in being a sponsor of the GSA Summit? For donations of $100 or more, we’d be pleased to thank you in our program, at the Summit and on social media, as well as providing table space for distributing materials. Just email Al Murray at al@southernequality.org to coordinate a sponsorship.